That relentless attitude is this Denver duo’s M.O. For their debut EP, …I Carry, surely they could have found a suitable studio in their native Colorado. But no, Trujillo and Mendoza weren’t going to settle for anything less than perfect, so they drove their van all the way to Massachusetts to record with one of metal’s most in-demand producers, Kurt Ballou (Converge, Cave In, Genghis Tron). 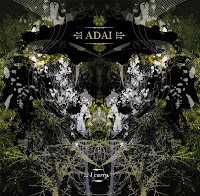 Since recording and self-releasing …I Carry in 2006-7, Adai has been hitting the road hard, touring with future labelmates Caspian, Junius, and Constants, among others. During that time, the band developed a relationship with Radar Recordings, who will be re-releasing …I Carry later this year. “We love everyone involved with [Radar] and they’re easily some of the hardest working people we’ve met in this industry,” Trujillo says. One gets the sense that Trujillo and Mendoza are perfectionists. From working with Kurt Ballou, to tracking down Seldon Hunt (Isis) to design the sleeve for …I Carry, to choosing to continue as a duo– on their own terms– when bands with lesser mettle would have thrown in the towel prematurely; Trujillo and Mendoza clearly love what they do. I really like this cd, however I can not get passed how low the vocal recording is and that is the only thing that I find undesirable about this EP.